After the Giants took to Twitter to make some rather unoriginal topics trend on Twitter last night, I think it only right to fight fire with a nuclear unicorn weapon. Of course, the hashtags in use have no impact on the game, but they provide a cathartic release for those of us who are sick of inconsistent strike zones and hitters diving for sliders low and away. That said, here are some rather depressing statistics and keys to game 7 for the Cardinals. Matt Holliday – Hitting .190/.190/.190/.381 in the NLCS just won’t do for a #3 hitter. Allen Craig – Hitting .150/.217/.200/.417 in the NLCS just won’t do for a #4 hitter, especially when you consider point 1. The Cardinals have only 3 stolen bases in the series. When you consider how good they are at hitting into double plays, it might behoove them to attempt a few more, especially when the situation favors the bold. Why not send the runner with 2 outs and someone like Carlos Beltran at the plate? If the runner gets thrown out, then the next inning begins with Beltran in the box. Just a thought. The Cardinals have 3 home runs and 11 walks in the NLCS. The team as a whole is hitting just .219/.267/.327/.593. Credit the Giants for a lot of that. Credit most of the remainder to hitters getting a little pull happy and trying to hit a grand slam with nobody on base. Matt Carpenter has a .500 OBP during what little playing time he has received in the NLCS. If he doesn’t start the game, then a pinch hitting appearance better be as the first left-handed bat used in a high-leverage situation off of the bench. Marp has already proven himself. 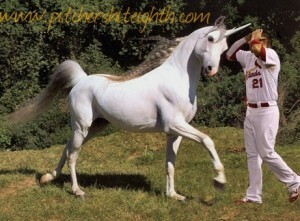 With Matt Cain going tonight, maybe Matheny should just find a way to get Marp into the game as a starter. The left-handed heavy Cardinals have been exposed a lot in this series. Need a right-handed pinch hitter? It’s pretty much Shane Robinson. That’s no slight against Skip Schumaker, Daniel Descalso, Matt Carpenter, or anybody who hits from only the left side, but that’s a matchup issue against a bullpen with 3 really good lefties. TIDBIT: I’ll probably never understand the animosity directed at Matt Holliday from a portion of the Cardinal fan base. In his 3 full seasons he has produced 13.3 WAR for $49.6M. That’s solid value for a guy making $17M per year. During those 3 years, he has played 439 regular season games and hit .302/.385/.517/.903 and averaged 90 RBI per season. Sure he’s been disappointing in the postseason, but you can’t find too many players on the team who haven’t dropped off a lot. I see no reason to single out Holliday.